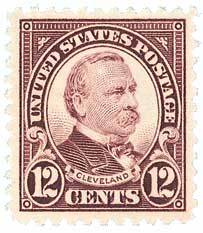 U.S. #564 – Cleveland won the popular vote three times – more than any other President. 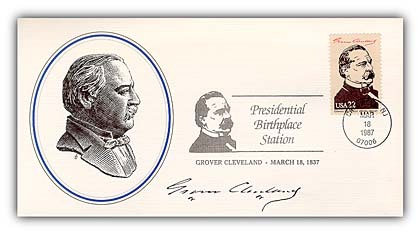 Stephen Grover Cleveland was born in Caldwell, New Jersey, on March 18, 1837, the fifth of nine children. He was a distant relative of General Moses Cleveland, the namesake of Cleveland, Ohio. The future President was named after the first pastor of his father’s church. However, he preferred to go by his middle name of Grover later in life. The Cleveland family moved to Fayetteville, New York, in 1841, where Grover spent much of his childhood. After his father died, Grover left school to help support his family. A few years later, an elder in his church offered to pay for his education if he would become a minister, but he graciously refused. Grover then set out west, stopping in Buffalo, New York, where he worked as a clerk in his uncle’s office and was introduced to the influential law partners of Rogers, Bowen, and Rogers. He then worked as a clerk in their office before being admitted to the bar in 1859. 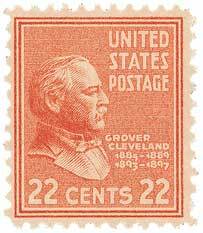 U.S. #827 – The 1938 Cleveland “Prexie” stamp. Cleveland remained with the firm for three years before leaving in 1862 to start his own practice. The following year, he was made assistant district attorney of Erie County. Cleveland had a prosperous law career, and became well known for his intense concentration and hard work, often presenting his arguments from memory. An 1868 case, in which he defended a local newspaper, garnered a great deal of attention from those in his profession. Although he could now afford a more lavish lifestyle than that of the boarding house, Cleveland was content and chose to support his mother and younger sisters instead. Cleveland first attempted to run for District Attorney in 1865, but narrowly lost to his roommate. In 1870, he was elected sheriff of Erie County, and went back to practicing law when his term was up. A major stepping-stone on Cleveland’s path to the presidency came in 1881. Up to that point, the Republican government in Buffalo, New York, had grown increasingly corrupt. So the Democrats sought out the most honest mayoral candidate they could find – Grover Cleveland. Cleveland won the election by more than 3,500 votes. He spent much of his term as mayor battling the interests of self-serving politicians. Cleveland frequently worked to protect public funds, building his reputation as an honest politician. In 1882, the New York State Democratic Party selected Cleveland as their candidate for governor. He won the election by more than 192,000 votes – the largest margin of victory in the state up to that time. Within his first two months in office, Cleveland sent the legislature eight vetoes. U.S. #2218d – 1986 Cleveland First Day Cover. Two years later, Cleveland was a natural choice for the Democratic presidential candidate. He won the election of 1884 by one-quarter of a percent of the popular vote, and with an electoral vote of 219 to 182. When he delivered his inaugural address the following March, he did so without the use of notes, which no other President had done before. Cleveland worked to reform other parts of the government, as well, such as when he signed the legislation establishing the Interstate Commerce Commission in 1887. He also worked with the Secretary of the Navy to modernize that institution and canceled construction contracts on faulty ships. Squaring off against the Republican Senate, Cleveland used his veto power a great deal, more than any other President up to that time. He vetoed hundreds of private pension bills for Civil War veterans, believing Congress should not override the Pension Bureau’s decision. 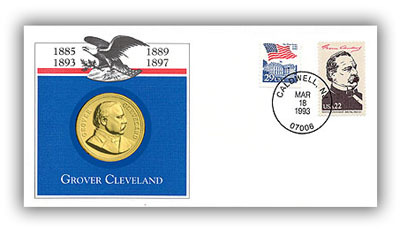 Item #81127A – Commemorative cover marking Cleveland’s 150th birthday. As a non-interventionist opposing expansion and imperialism, Cleveland had little concern for foreign policy. He was against the previous administration’s Nicaragua canal treaty and discouraged the Senate from talks about the Berlin Conference treaty, which would have opened doors for the U.S. in the Congo. Concerning civil rights, Cleveland saw Reconstruction as a failed experiment and hesitated to use Federal power to enforce the 15th Amendment guaranteeing African-Americans the right to vote. Cleveland took a more positive stance concerning Native-Americans, saying in his inaugural address that, “[t]his guardianship involves, on our part, efforts for the improvement of their condition and enforcement of their rights.” He supported the Dawes Act, which would distribute Indian lands to individuals, rather than being held in trusts by the Federal government. Cleveland saw the act as a means to lift the Native-Americans out of poverty and join white society. However, it actually weakened the tribal governments and many individuals sold their lands. As the election of 1888 approached, the tariff issue took center stage. The Republicans, with Benjamin Harrison as their candidate, campaigned to keep tariffs high, gaining the support of industrialists and factory workers. Cleveland stuck to his position that high tariffs were unfair to consumers. Although Cleveland narrowly won the popular vote, Harrison took the Electoral College. This was the third of just four times in U.S. history that the winner of the popular vote did not win the election. While Cleveland looked forward to the peace of private life, his young wife, Frances, instructed the staff to take good care of the furniture and decorations, “for I want to find everything just as it is now, when we come back again.” When asked when they would return, she said, “four years from today.” Little did President Cleveland know just how right she would be. Item #97734 – Cleveland commemorative gold medal cover. While Cleveland happily enjoyed private life in New York City, President Harrison’s administration passed the McKinley Tariff and Sherman Silver Purchase Act. Cleveland saw both of these policies as dangerous for the nation’s economy. He initially decided not to speak out about his outrage, but he later felt it was his duty to address these concerns. Cleveland submitted an open “silver letter” to a meeting of reformers in New York. This letter made Cleveland a national name once again, just as the 1892 election approached. He went on to win that election, returning the White House as his wife had foretold. Shortly after Cleveland entered office, the Panic of 1893 struck the stock market, and the country was in a state of acute economic depression. After 15 weeks of debate, the Senate repealed the Sherman Silver Purchase Act, eventually returning the Treasury’s gold reserves to safe levels. Next, Cleveland turned his attention to reversing the McKinley tariff. Though he considered the new Wilson-Gorman Tariff Act to be “a disgraceful product of the control of the Senate by trusts and business interests,” he still considered it an improvement over the McKinley Tariff and allowed it to become law. Cleveland called upon the Monroe Doctrine when a dispute arose between Britain and British Guiana over the boundary between that nation and Venezuela. President Cleveland and Secretary of State Richard Olney insisted that the U.S. be included in arbitrations over the matter. The tribunal met in Paris in 1898 and the following year, gave the majority of the disputed area to British Guiana. Cleveland’s actions, supporting the Latin American nation against the colonial power, improved relations with America’s neighbors to the south. Additionally, the polite manner in which he handled negotiations with Britain established improved relations with that nation as well. 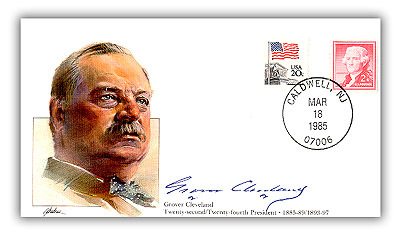 Item #81410 – Commemorative cover marking Cleveland’s 148th birthday. Anti-Cleveland agrarian and silverite Democrats took control of the party in 1896, rejected his administration and the gold standard, and nominated William Jennings Bryan. Cleveland supported the Gold Democrats’ third-party ticket, but decided not to accept their nomination for a third term. In the end, Republican William McKinley won the election. 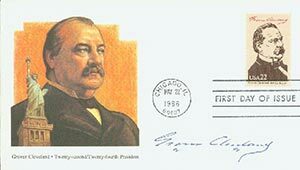 6 Responses to "This Day in History… March 18, 1837"
picture of the late 1800’s and the issues that both President Cleveland and President Harrison faced. Wish I had this when I took history in both high school and college. Great article of a largely forgotten President. Cleveland’s distant ancestor Moses spelled his name “Cleaveland.” There are varying accounts of why the “a” was dropped from both the name and the city. While not nearly reaching the accomplishments of FDR, he entered his presidency during somewhat similar a national financial crisis. His decisiveness, midst obvious opposition, helped to quell “The Panic”. I believe his final words to be honest and certainly words to live by today. Makes me proud of my Buffalo roots. I wish that Grover Cleveland was running in 2016. We need a fine person like him instead of who is running now. we need one like him now ..